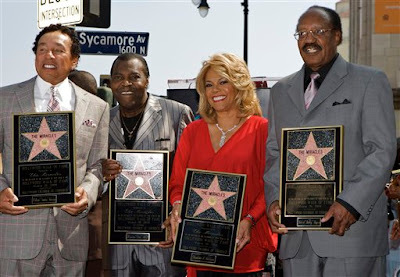 On Friday March, 20, 2009 The Miracles also known as Smokey Robinson & The Miracles finally got their Star on the Hollywood Walk of Fame. Smokey Robinson also known as the King of Motown has had a star for 20 years as a solo artist. Several of their Motown friends came to show their support: Motown founder Berry Gordy, Mary Wilson from The Supremes and even Stevie Wonder! Motown is celebrating their 50th anniversary in the music business. Both Smokey Robinson and Berry Gordy will appear on American Idol this week for Motown week.